Gauge 18sts & 24rows to 10cm / 4″ square using 5.00mm (8U.S. / 6 Imperial) needles. This features a unique deer skull cable design. 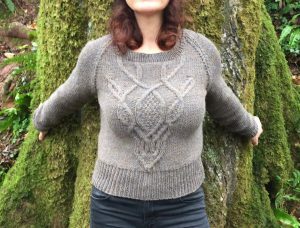 The sweater itself has a deep ribbing to the waist and some shaping to the chest for a close fit. It has raglan sleeves and a crew neckline. The cable design is in chart form. Any Aran / Worsted yarn that knits to the specified gauge of 18 sts x 24 rows may be used. Instructions are given for 11 sizes ranging from UK Size 6 /US Size 4 / Chest Size 30in / 76cm, up to UK Size 26 / US Size 24 / Chest 48 in / 122 cm. The garment is worked without waist shaping and so can easily be knitted to a longer length. These garment instructions are for flat knitting from the bottom up. The back, front, and both sleeves are worked separately, and then joined together. The neckband is formed by picking up stitches around the neckline after the right shoulder seam has been joined. 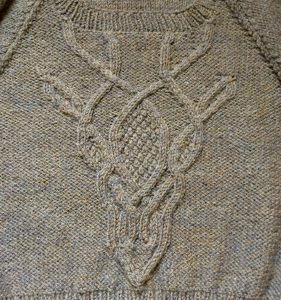 The main body of the garment is worked in stocking stitch. The bottom edges of the body, the cuffs of the sleeves and the neckband are worked in a single rib stitch using the smaller needles.